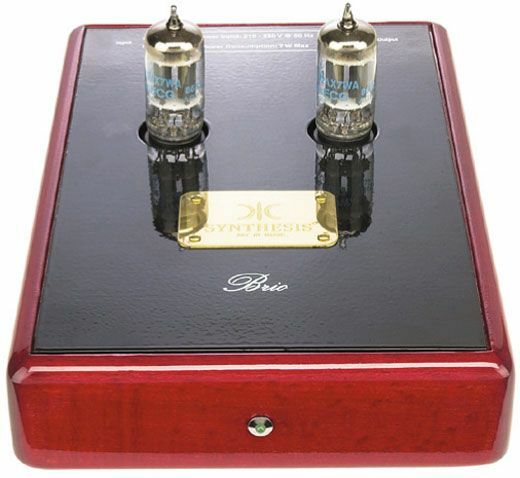 Brio phono stage is caters for both MM and mid-high level MC cartridges with high output impedance. Separate power supply (included) reduce the interferecies from a power line. All of our units are designed in order to be able to reproduce music in normal domestic atmospheres, rather than only in an acoustically perfect room. Great care has been given to the aesthetic factor. Beautiful real woods and matched finishes make these units a perfect partner with the other fine products of Synthesis. With such a choice this allows with both great elegance and refinement these systems to integrate seamlessly into any home environment. Rear: Power plug, protection fuse.